What was the Greatest Battle Report of 2017 - only YOU can decide! We have 10 amazing nominations, going head-to-head in an all out bloodbath to claim the ultimate accolade - the title of The Greatest Battle Report of 2017. Each Battle Report has been expertly crafted from the finest old-school lead, rules and sensibility to produce tales of bravery, madness, heroics, strategy, tactics and blunders on the tabletop. You can vote at the Oldhammer Forum or leave a comment below with the name or number of your favourite Battle Report of 2017. Vote wisely - there can be only one! Is that model Oldhammer ? And this one? Every now and then the question comes back and while some will argue that the true proper "Oldhammer models" are those issued during what they see as Games workshop's true 'Golden Era' (begining and end dates will most likely vary with every single person), some others will tell you the only true Oldhammer way is to get ANY model on the table, whatever the maker, the release date, material or anything. Rest assured, I will not try to give any definition here but I'd be more interested to see what kind of models get made AROUND the Oldhammer community or state of mind. I'll just list some projects run by enthusiats who feel like filling the voids left by discontinued references and who want to make things happen. I'd really like to emphasise that for most of (if not all) people involved here, this is not their main job but a side project to which they dedicate quite some time, energy and money. Given the quality of the work and the price applied, you can really see the dedication here ! Darkling Games is the line of miniatures run by Oldschool Goddess Delaney King. Her range includes some fantasy evil dwarves sculpted in that delicious retro taste that fits juts right in with the chaos dwarves of the early kind. Delaney has some very exciting projects for the future including Arse cannons, sphincter beasts (my personnal bias inclines me to listing those first) but also many tasty projects you can follow on her dedicated blog HERE. Diego Serrate has graced us with a Kickstarter getting its roots in the early days of rogue trader but with his own excellent touch and amazing skills. His modern approach and added ideas really fill voids in our oldschool collections AND brings new horizons for fun. Go and visit his Kickstarter (still running) to see all the references available (you will probbaly end up emptying your bank account but after all, money is safer in the hands of talented artists that in tose of bankers) ! 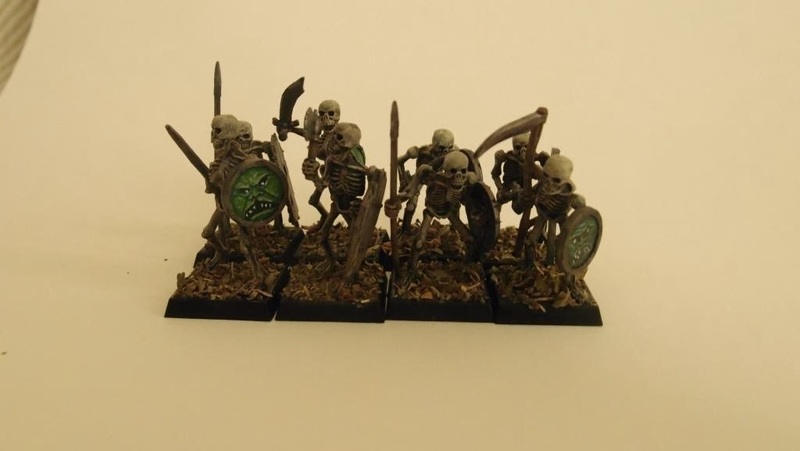 Via Ludibunda is the range owned by Treps (of Oldhammer origins) and it offers very original models amongst which a wonderful set of goblin pirates (sculpted by no other than the Goblinmaster Kev Adams himself), harryhausen skeletons, Oldschool ogres and much more ! Oakbound is the range managed by Geoff Sims. 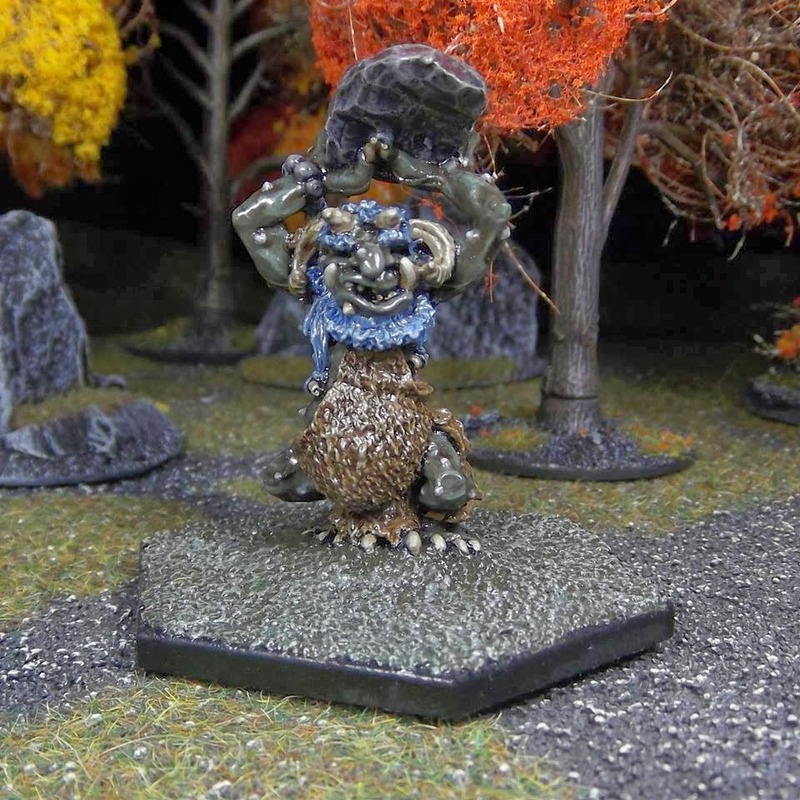 It has steadily been augmented over time to create a whole range of celtic inspired fantasy creatures amongst which those who love one-eyed bog dwellers should be very fond of but it doesn't stop here as the models cover a whole range of bizarre creatures to fit in the unique set of rules created for the occasion. 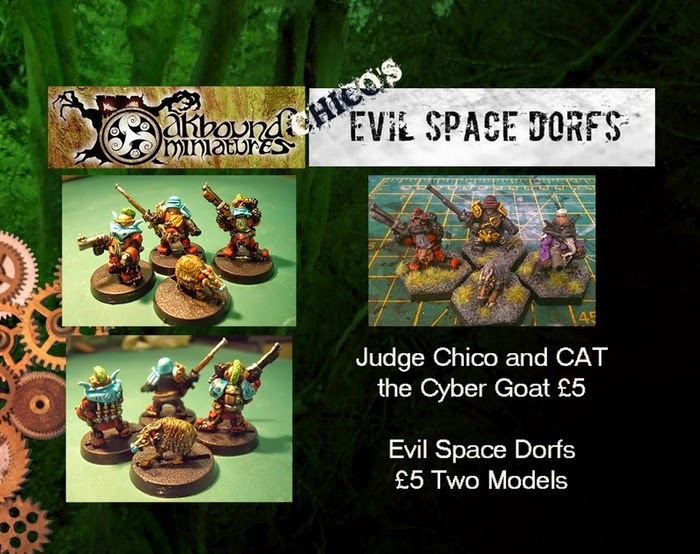 The most deviant (and more sci-fi inclined) of you will even have the chance to get their hands on evil dorfs and some strange Judge trying to make his authoritaaaa respected. Initiated by the most excellent Axiom with the participation of fantasy illustrator Will Beck and figure designer Michael Anderson, Colony 87 is a Kickstaret that funded in no time to provide a set of original and characterful civilian models for sci-fi games. The massive success of the first waves can only let us dream of many more to come ! 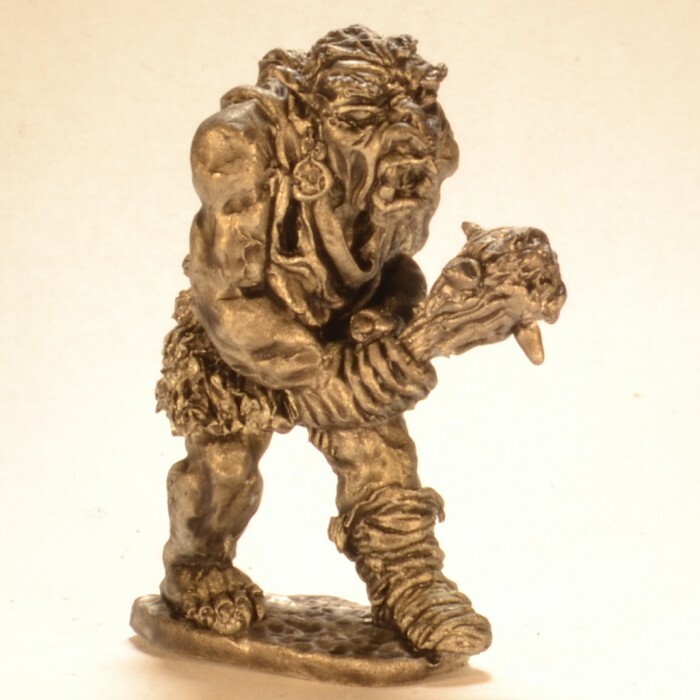 A crowdfunding project is about to see th elight of day and if you ever felt like a genuine fantasy dwarf enthusiast, keep an eye open on this one ! The variety of models available and their quality will have you dreaming for quite a while so get yourself a good beverage and browse the wonders HERE. The range is splendidly evocative of the old days favoured in our community and will offer an excellent alternative in terms of poses and prices to what you'd get on the bay of E. Have a look at Clam's site. These are just the sites and projects that pop up to my head right now but if you know or run any similar projects, by all mean share them in the comments and we'll gladly update to share it around ! There have never been better times to be oldschool than now ! With only a scant few months to go Bring Out Your Lead 2015 is shaping up for the weekend at the end of July, start of August this year so it's time to get onboard and make plans. By the huge generosity of the international community of Oldhammerers - a limited quantity of Mark Copplestones renegade rocking road warrior 'Boylee Idol' miniature will be made available, for free to participants at the event. Exactly how it's decided the miniatures will be distributed is a dark and sorcerous affair, but it's expected that those who are running a game and those who have registered may be given priority. Most of the tables are already booked on the Saturday - with a few slots in the afternoon and the morning left. The Friday and the Sunday have good availability. So if you want to run a game, now is a good time to book it in! If you just want to pop over and see what is going down, please do, but beware that Foundry have limited car parking spaces. And finally, even if you can't make it (like me, *sob*, *sob*) SPREAD THE WORD! as the ABC Warriors might say - feel free to post the flyer above on your blog, social media, Club wall, FLGS noticeboard or where-ever you like. Let's make 2015 the biggest and best BOYL yet! *Events subject to change. Unfortunately Susan Boyle has declined the offer of performing a set of cover versions of Bolt Thrower songs this year. I know many of you will be disappointed, but BOYL is going ahead regardless of this setback. Gaj/Weazil has some very wonderful news for all of us attending BOYL14, straight from Bryan Ansell no less. Link to Oldhammer forum post. I'm sure I'm not over stepping the mark to extend my thanks on the behalf of all of us here at the Oldhammer blog to these two Titans of warhammer let alone Oldhammer. I recently asked Rick Priestly, Tony Ackland and Bryan Ansell to reccommend some of the books that inspired the early development of Warhammer to share with the Oldhammer community. Rick and Tony kindly responded with a wealth of material, and indicated the kind of books that Bryan was reading and recommending at the time. The authors mentioned are listed below, where no title was given I have noted the most well known or typical of that authors work. Although split into Fantasy and Rogue Trader, this division is somewhat artificial. Some material clearly has influence into Laserburn and Reaper eras as well as into the development of Warhammer and beyond. It is also clear that several of the authors had a direct and broad influence, Moorcock and Herbert especially, whereas others figure as background reading and yet others lend perhaps only one or two specific motifs. The recurrence of comic-books is notable, as is the inclusion of works of parody. The list is by no means a definitive list of literary sources for Warhammer. other games, both Greyhawk and Glorthana, from Dungeons & Dragons and Runequest respectively clearly influenced the 'world' of Warhammer. Nor is this list intended to define a cannonical range of Oldhammer settings - the worlds of George RR Martin, Douglas Adams or Stan Lee are as just as open to gaming with Warhammer - nonetheless I hope my fellow Oldhammeristas find this compilation of some interest, entertainment, and perhaps inspiration for your own games. 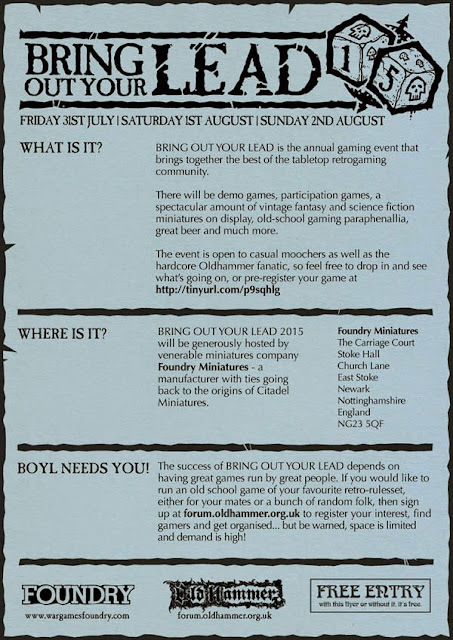 The Oldhammer community are pleased to officially announce Oldhammer - Bring Out Your Lead! (2014). Of course, you've heard about it already. But this is the official announcement, so now you can officially start panicking about how long it will take to grow a mullet. 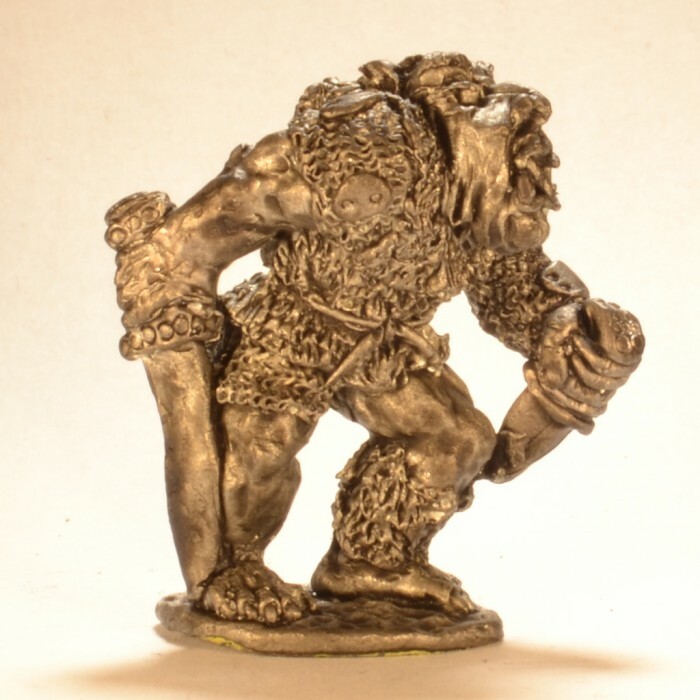 We are also extremely pleased with and grateful to our hosts - Foundry Miniatures in Nottingham. The event is taking place over the weekend of the 08/08/2014 (Friday afternoon onwards) - 10/08/2014 (Sunday). So, first things first: This is a gaming event. The entire idea and surely the primary purpose for attending is to play games. BUT - it is NOT a tournament. Nothing can be won. Your victory over your opponent is purely moral and for retelling in a pub later. There are no ladders, no leagues, no recognition of your amazing army building talents and keen interpretation of the rules. THIS IS NOT A TOURNAMENT! Which makes things a little harder to organise. In a traditional tournament, the organisers would set a points limit, army restrictions and painting guidelines in order to ensure that everyone has a fair chance. There is no need to worry about who matches who, as once the first game is completed, better players will be faced off against better players and the whole thing is supposedly fair. Because it's NOT A TOURNAMENT, we can't do any of that. This means we need your help. In order to understand the numbers attending, we have a booking form. BUT, because it's NOT A TOURNAMENT, the organisers will not allocate you an opponent on the day. Read this as the organisers do not guarantee you a game. You, aspiring gamer, CAN ensure a game, however, by following up your booking with an entry on the Oldhammer Forum BOYL 2014 Thread. In this forum, you will be able to tell others what you're planning to bring, how many points/figures you plan to field and what sort of game you want to play. You are still welcome to simply turn up at Foundry with your army and no booking, but if there is more demand than supply, preference will be given to those who are registered. Entry to the event is free. Our generous hosts, Foundry Miniatures, are not charging us for the venue, and as it's NOT A TOURNAMENT, we're not offering any prizes. Of course, you still have other costs to consider - if you're travelling a long way, you might need a place to stay overnight. You will need to get there. And, of course, you'll probably want to get an army ready. Start saving now! Where and when is this all happening? Friday (08/08/2014) from 13:00 until 20:00. Saturday (09/08/2014) from 10:00 until 20:00. Sunday (10/08/2014) from 10:00 until 17:00. Please feel free to call Foundry if you have any questions on how to get there or where to park, etc. We do ask that you arrive on time, as you will need to factor in finding your game, meeting your opponent, unpacking and packing of figures and copious amounts of pointing at things and going "Wow! Is that (delete as appropriate) [your amazing paint job / that ultra rare figure I've never seen in real life before / really your sister*]? *Okay, probably not that last one. Foundry? They're in Newark-upon-Trent! That's miles away! Yes, it is. As mentioned above - they have offered their facility free of charge. They have the space, the tables and the interest in the hobby and so stand head and shoulders above any other option we've considered to date. To be clear, we have no official relationship with Foundry - they've offered because they have an interest in what we're trying to achieve and they've offered us the facility as a result. That's awful nice of them! Yes, it is. So lets talk about Foundry. Perhaps you've heard of Bryan Ansell? No? Once upon a time, he ran Games Workshop. Take a look at your Warhammer 3rd Edition books - that's right, he co-authored some of them. Marcus (Bryan's son, following in the family footsteps) runs Wargames Foundry. They have a clear 'spiritual' connection to the Oldhammer movement. We mention this because we ask that the Oldhammer community respect the facility and the effort that Foundry (and the Ansell family) have gone through to host this. When you're on site, please don't litter, or break things, or steal, or do anything that would bring the Oldhammer community into disrepute. We would dearly love to be invited back to the Foundry. Keep this in mind when you attend. The Ansell family also conduct business in catering. As a result of this remarkable good fortune, Foundry are able to offer hot food and are licensed to sell alcohol. Of course, you'll have to pay for this (expect typical pub rates), but you won't need to go foraging around the fields of Neward-upon-Trent for food. A note of warning: if you are unable to handle your alcohol, you will be ejected from the event immediately! The idea here is to fulfil every gamers fantasy of playing cool games whilst having a pint - not to lose your temper and get involved in a fist fight. Fear not, citizen! Participation events there will be. This is the place to determine which ones you're interested in. In case you missed it: this is NOT A TOURNAMENT! The only unpainted figures we're expecting to see are those being traded. If you are playing a game, you must play with painted figures! Painted figures are a sign of respect to your opponent and to the community. Chances are, you're not as familiar with the old rules as you think you are. Take some time to read the rules before you arrive, but please allow for the fact many of the 'classic' rulesets are badly organised, badly written and sometimes just plain missing. You should expect that your game will involve lots of reading and discussion as you try to work out how to resolve whatever is happening. Don't panic - this is normal! You may bring figures from any manufacturer and from any era. Although the Oldhammer movement is rooted in the 80's, we are interested in the spirit of Oldhammer, not the manufacture. You are as welcome bringing a heroic scale 28mm modern plastic army as you are bringing your soft lead pre-slotta army. There is a question on the form about scenery. Foundry have offered to supply some scenery, but if you are able to bring something, please do - every little bit helps. Where possible, we'll do our level best to ensure that scenery remains table specific - both to satisfy the aesthetic 'it all looks the same' perspective and to help ensure that your scenery is all in one place (for easy identification and care). Ultimately, you are accountable for the fun you have. This event is a framework for you to create the ultimate oldhammer experience that you never had in your youth. We're trying to make it as flexible as possible, but we can't do that without your participation and effort. Let's be clear: you will have to do something for yourself before you arrive at Foundry this summer! Neither the organisers nor Foundry Miniatures accept any responsibility or liability for you. Okay, I'm in. What am I supposed to do again? 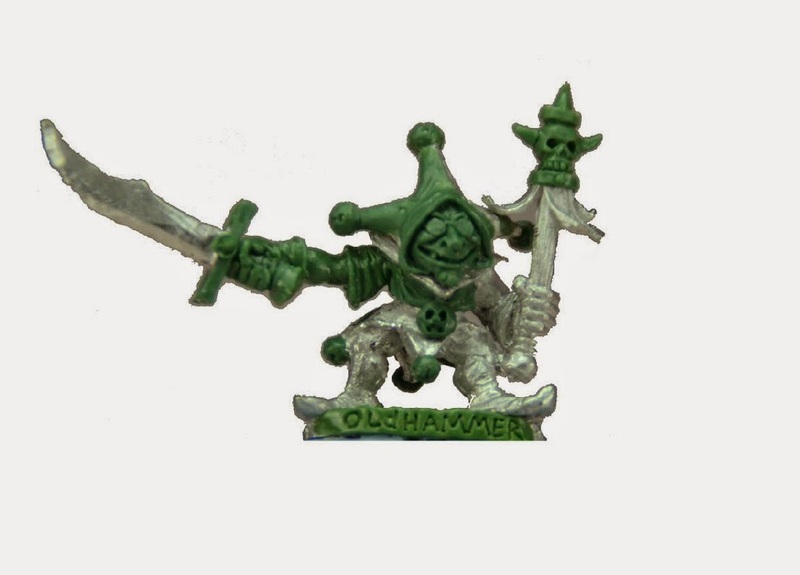 Register on the Oldhammer Forum! 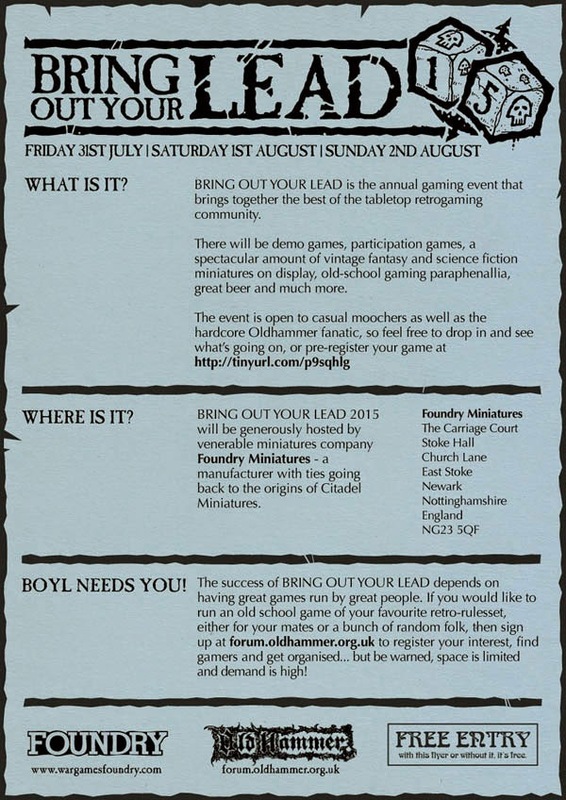 Create an entry on the BOYL 2014 thread to organise your games! Pitch up on the weekend! Try not to explode from all your misdirected excitement until then! Oh - did we mention that this is NOT A TOURNAMENT? Good. Labels: Bring Out Your Lead! 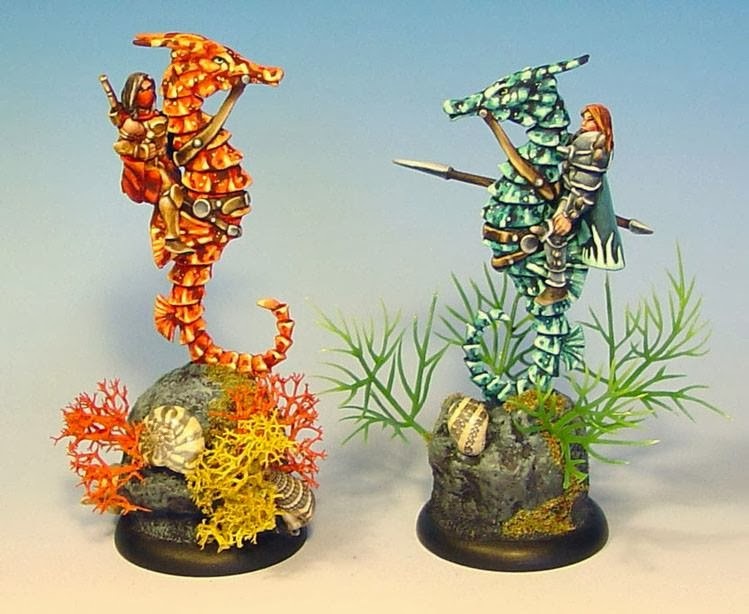 Welcome back to this, our second weekly round up of the most interesting pieces of Oldhammer painting this side of the Lustrian Continent. 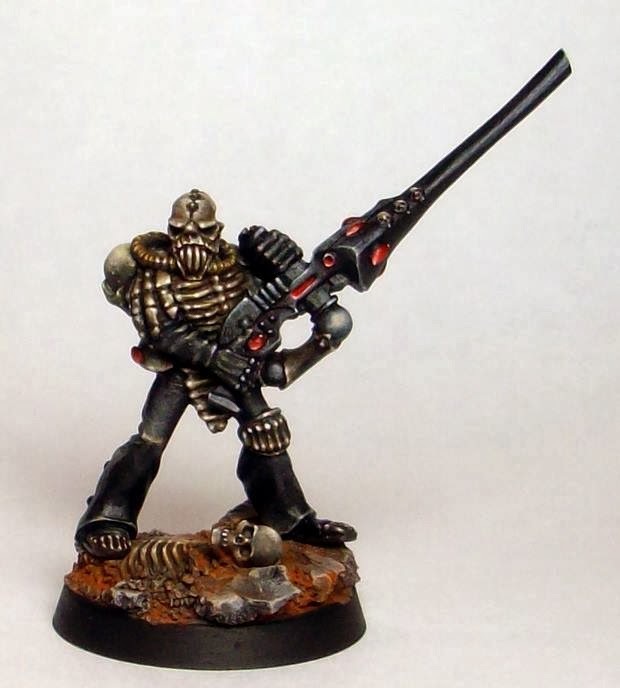 Think of this article as the old school 'Eavy Metal fix you used to get monthly, when you never quite new which miniatures would pop up and things were not organised around release schedules - well not quite so much! The painting was often organised by individual painters too, as do we here on the Oldhammer blog. Sadly, you cannot count on me to impart loads of quality painting advice as I am rather rubbish at dabbing the stuff on minis. Thankfully, we have a whole stack of people around our community (and a bit beyond it) who are producing imaginative and inspirational pieces or work. There, two words. Inspirational and imaginative. They are all that I look for when I put together these posts. No dreary generic colour schemes here. Nor any photoshop monstrosities. Just pure and simple Oldhammer goodness. Kari Hernesniemi provides us with the first figure this week with an incredible Harboth painted model. He has nailed the 'look' of the old school here and his work is heavily influenced by '80s Blanche. Just look at the quality apparent on that shield and the associated piece of armour around this orcs ample belly. OUTSTANDING! Kari has used colour to great effect here, making the model seem real (and not like the cartoon characters that I produce) and beautifully lit. I love they wash that washes have been used to suggest not only depth in the armour, but also a greasy rusty filthy quality too. You can tell that this chap hasn't maintained his equipment in any shape or form. Though the excellent painting does pose the question of where all these orcs get their painting done, doesn't it? The exquisite work spreads to the trousers as well, with some technically brilliant patterns not to mention a hyper realistic base. This is the first of two chaos miniatures painted by Carlos Pantojo Martinez from the Spanish Language Facebook group. As members of that group will know, Carlos is a prolific and extremely gifted painter who dazzles us all with his work. Here we see a perfectly interpreted Slanneshi Champion, painted with all the pastel tones that you would expect of the Pleasure God but without looking like a Liquorice Allsort! Careful layering has brought out the highlights to perfection here and unusual colour choices for the armour help key in the chaotic nature of the old chaos range. The old school base helps support the crazy colour scheme and results in a model that appears to have step out of Slaves to Darkness. A second piece by Carlos, one of the original plaguebearer models (and some of my personal favourites since boyhood) sculpted by Kev Adams. He has used similar tones to the Slanneshi champion but this model makes great use of that rather unearthly green. The innards and claws are simply presented, as is the sword but the face has some exquisite detailing, especially on the tongue. Lovely teeth too, with a great suggestion of rot on that daemonic enamel! You can almost smell this daemon's breath! 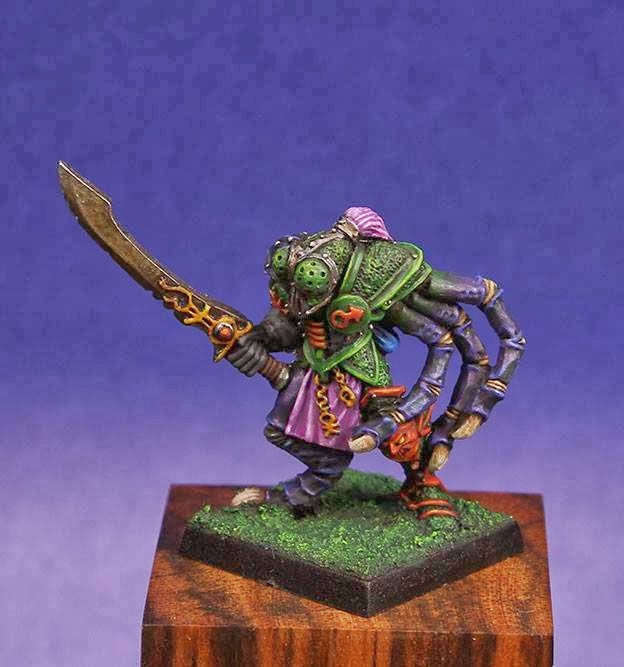 Jeff McC is well known in the Oldhammer Community, particularly on the forum, and I have chosen wonderful goblin fanatics for inclusion this week. I love the bright green he has got on his models and the beautiful contrast he achieves with the blues and golds of the fabrics. But it is the home made bases that really inspire! According to Jeff, the bases he created are designed to give the impression that the fanatics are spinning recklessly out of control. What a fantastic idea and really simple to pull off. The added mushrooms are a nice touch too! 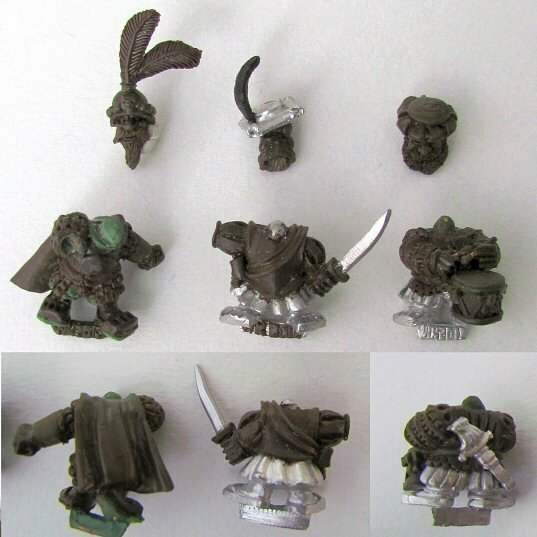 Tartar Sauce has shared with us some striking half orcs, one of the races that don't get much love on the Oldhammer scene. His work goes to show that you don't need an intricate painting style to pull off great looking models. His simple, clean style provide all that is needed to produce a great looking unit. I love the way he has off set the green on the models' faces with the crimson red or the shields. I would be proud to have models looking this good on my miniature shelf! Juancho Pinta is another Spanish Oldhammerer. 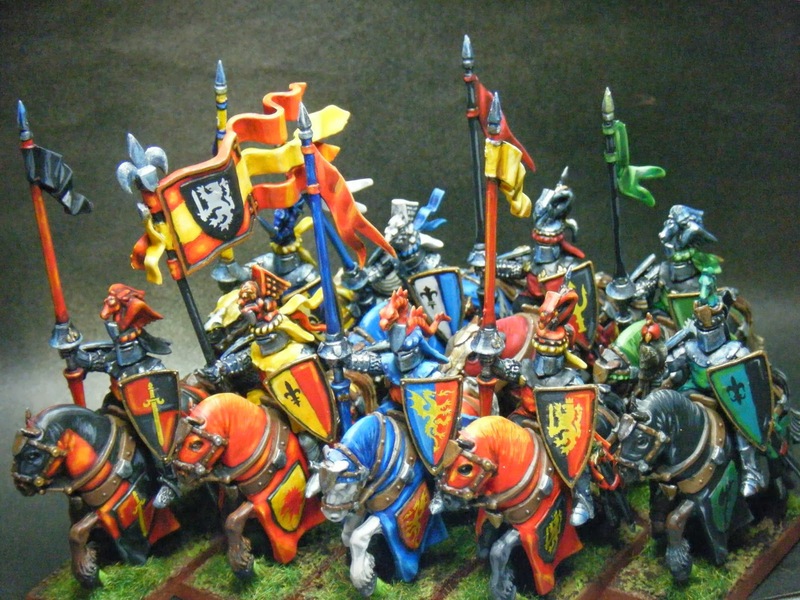 Here we has a selection of his Bretonnian knights. And how splendid do they look? I love the riot of different colours used here and the brilliant detailing on the shields, tabards and pennants. Closer inspection of his style will show that this striking finish has been created with some harsh highlighting rather than blending. I am sure that you will agree with me when I state the this style really works with bright, detailed figures such as these. Gareth Shaw has been busy at work this week, publishing some striking beastmen for his Nurgle Chaos project. These pestigors are full of rather unhealthy menace and his limited choice of tones suggests a diseased squalor. 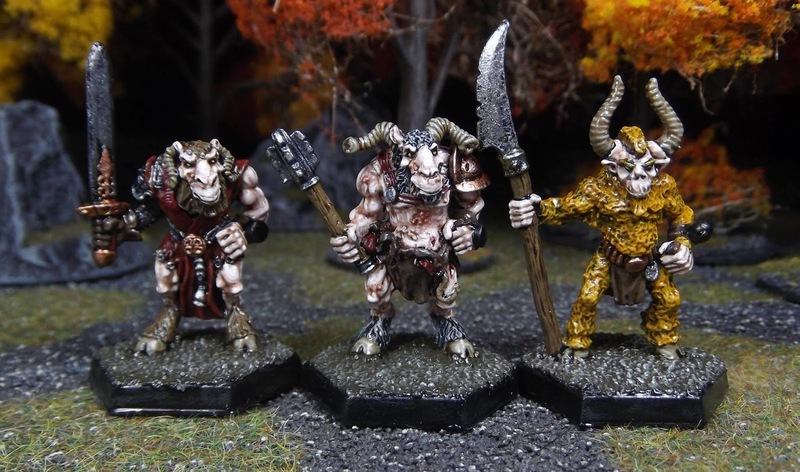 I am particularly interested in the way he contrasts the lighter skin tone, which is more similar of modern paint jobs of beastmen, with the darker shades used for the clothing. This really makes the models 'pop' out at you on the table top. Now, the just need some suitably Nurglesque shields! Now Gareth was discussing how best to varnish your models on the Facebook Group. His thoughts turned into quite a discussion about the best media to use. As you will have seen from his beastmen, and the troll above, Gareth has been using gloss to keep his paintwork secure. Now gloss varnish brings make memories of distant yesteryears for me, ranks upon ranks of red coated soldiers and, of course, the work of Steve Mussared. 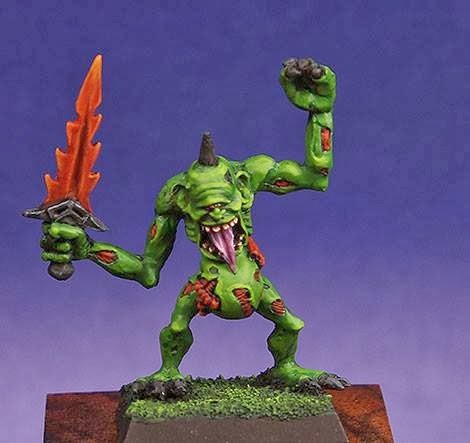 I feel that his use of gloss really brings out the oozy nature of the Nurgle models and makes a refreshing change to how we see miniatures presented. 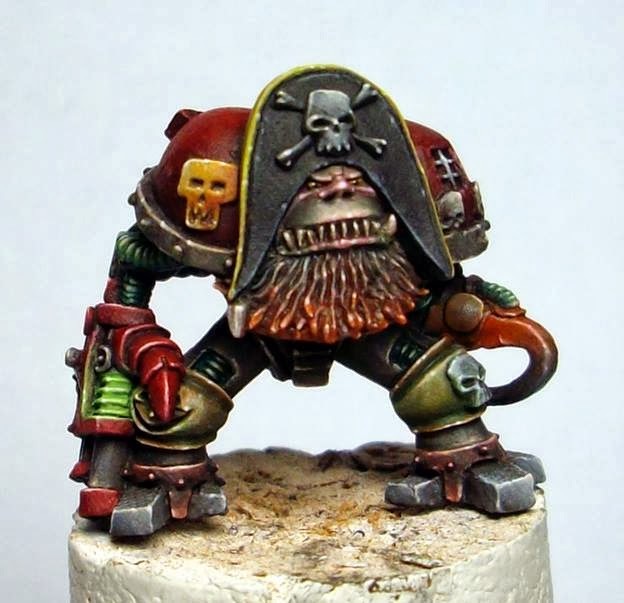 CreepyPortrait is fairly new on the Oldhammer Scene but he has shared with us some dark and dangerous looking work in the last week or so. His skeletons are brilliant, and perfectly represent the earthy bones of some long dead warriors. 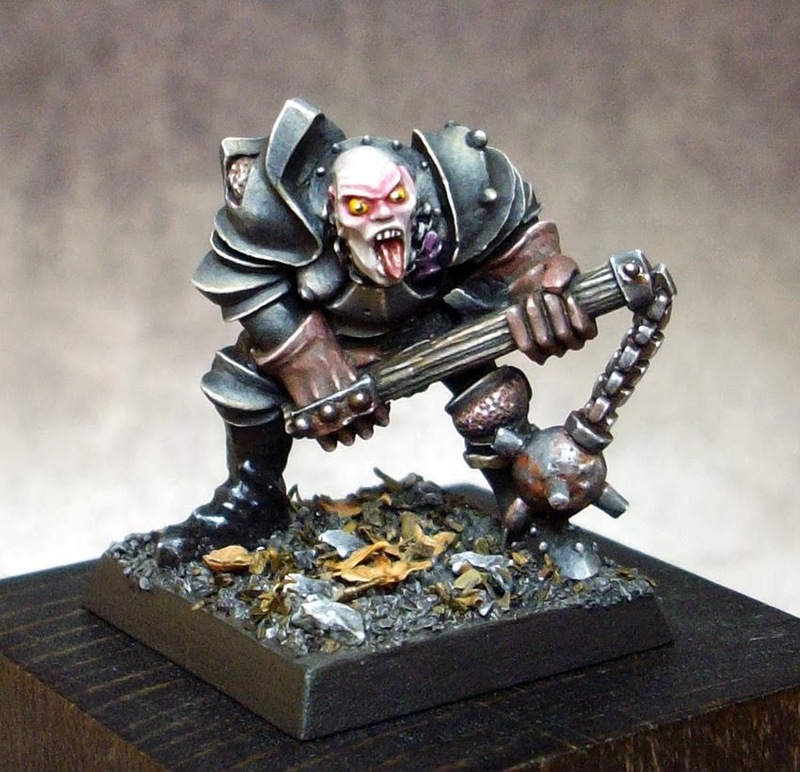 Though the photographs are a little dark, it looks like CreepyPortrait has used a combination of washes and drybrushing to created the feel of the bone though I am not so certain what he has used to create the textures on his bases. The shields too are really evocative of the skeleton horde, and feature some ghastly (in a good way) facial designs on them. Designs that I will be stealing in the future! 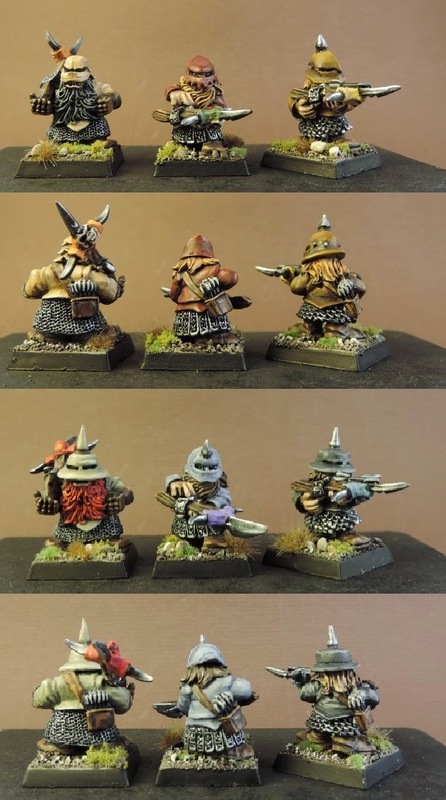 Goumon Gael painted these for Mick Leach ( I think) and I thought them worthy of a share here. Here we have a strand of the fantastic that seems to leap from the pages of the original fantasy miniatures books of the '80s. Bright colours, naturalistic patterns and intelligent basing makes for a excellent result. I love the use of aquarium plants and real snail shells too. And finally, Fanch Pandera has been hard at work with his classic Citadel leadpile in recent days. His work is 'Eavy Metal standard really and remains hopelessly out of our ability range but isn't it a joy to see? I find that just gazing at work of this standard gets me thinking about how to improve my own because I notice loads of little touches that I could apply to my own work. Well, I hope you enjoyed this week's run down through the Oldhammer painting world. I certainly enjoyed putting these images together and discussing what I thought about them. Feel free to make your own judgements and comments as you don't have to agree with me. I hope to make this post a weekly dose of goodness, but i suspect it will bounce around a little regarding publication days as life intervenes. Somewhere the teas getting cold.